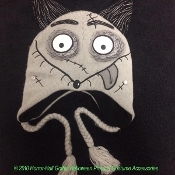 Trendy new cozy warm winter deluxe Peruvian Laplander unisex pilot style funky novelty soft stretch acrylic knit beanie hat with polyester fleece lining, features licensed Disney FRANKENWEENIE SPARKY the Dog design cartoon character with braided tassels hanging from cap earflaps. Trendy Franken Weenie SPARKY the Dog decorated Peruvian style Laplander hat is not only a comfortable and funky cap that will get your outfit noticed, but makes a fun cosplay costume accessory for parties and holidays. Tasseled soft stretch acrylic deluxe licensed Disney character knit beanie with polyester fleece lining makes a warm cozy bike or ski hat, too. Unisex Peruvian Laplander fits most teens and adults.